Thank you to Dr. Derman for providing me with this coloring book to review. All opinions are 100% my own. Have you ever heard the term “good grief” and it just seemed like an oxymoron since there is no such thing as good grief? Grief is sad and difficult to process. Grief comes with heartache and stress. No way can it be good! My beloved father was diagnosed with leukemia and things weren't progressing as well as we would have hoped. I had anticipatory grief, the thought of him being gone was at times too much to bear. When he passed away, I had staggering amounts of grief that would swell from even a simple memory and realizing as I was upset that my instinct was to call my dad to make me feel better and that was no longer an option. I turned to avoiding thinking about it at all, a feat near impossible even though I tried. I was given the opportunity to review a new coloring book concept—one specifically for healing after a loss, for losing yourself in the colors and patterns when you are having a hard time. For anyone needing an outlet for channeling feelings of sadness, anger and despair. Colors of Loss and Healing helped me more than I thought it would. I wasn't sure that I could get my brain to slow down enough to focus on it but I found myself enjoying the process, even feeling like I wanted to stop my work on a busy day and just color for awhile. Dr. Deborah Derman and her illustrator, Lisa Powell Braun, bring you a wonderful coloring book with inspirational words throughout. Debby has had her share of personal losses and has spent the past 20 years as a grief counselor and is the survivor of a rare form of breast cancer. I was sent the book by Debby herself and I ended up corresponding with her several times, often on a personal level, and she is so warm and encouraging. I fully plan on recommending and gifting the book to loved ones who may need a helping hand to quiet a restless spirit. 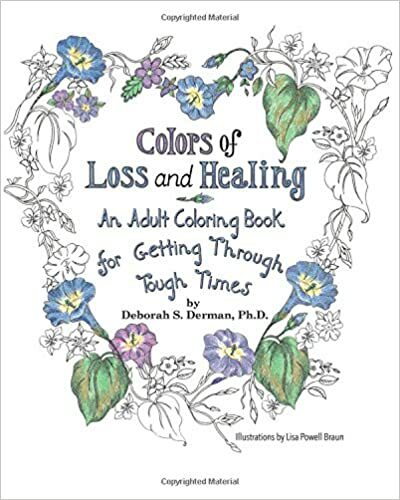 If you would like a copy of the book, Colors of Loss and Healing: An Adult Coloring Book for Getting Through Tough Times can be found on Amazon and www.deborahdermanphd.com. If you would like a free pdf of a page from the book, email Debby at debby.derman@gmail.com. She can also be found on Twitter and Facebook.